Well, this was a lovely discovery! Kitchen was in a stack of books given to me very randomly by a friend who moved away a couple of years ago and did a big purge. She has great taste, but also loves to buy books, so I’m finding it all a little hit and miss. I wish I had picked this up the day my friend gave it to me. It is incredibly, beautifully written, so also I must give due credit to the translator, because it is translated from Japanese. The style is pretty stunning. I had just finished reading Beachcombing for a Shipwrecked God, which is also a study in grief, and I felt like I had found fresh water after trekking through the desert. Where Beachcombing was self-conscious, Kitchen is quietly confident. Where Beachcombing was narratively confusing, Kitchen is fluid and steady. I don’t mean to keep beating on Beachcombing. 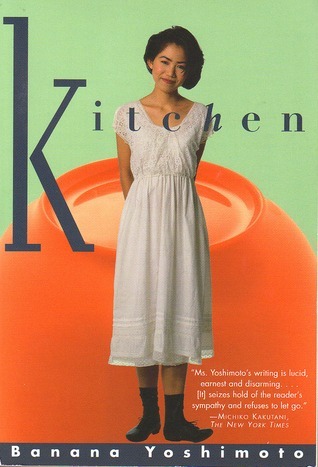 Mostly, what I’m saying is that Kitchen is a really incredible piece of writing, and I am super grateful to have found it. I’m going to be thinking about it for a long time. Kitchen is actually two stories with no direct link, and I’m fascinated by that. Both stories speak to the grief process, a love of food and the process of cooking, personal comfort, mysticism, the mundanity of daily life, and also, interestingly being transgender… good on her; she wrote this in the 80’s! They are both outstandingly interesting and captivating stories that could stand alone, but are even stronger together.